Roseanna M. White grew up in the mountains of West Virginia, the beauty of which inspired her to begin writing as soon as she learned to pair subjects with verbs. She spent her middle and high school days penning novels in class, and her love of books took her to a school renowned for them. After graduating from St. John's College in Annapolis, Maryland, she and her husband moved back to the Maryland side of the same mountains they equate with home. Roseanna is the author of two biblical novels, A Stray Drop of Blood and Jewel of Persia, both from WhiteFire Publishing (www.WhiteFire-Publishing.com), and Love Finds You in Annapolis, Maryland, a historical romance, with Summerside Press. 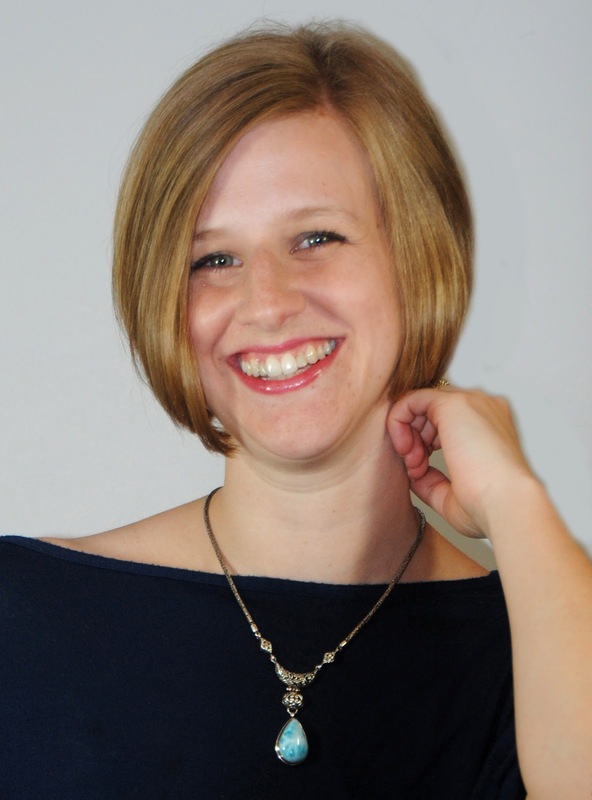 She is the senior reviewer at the Christian Review of Books, which she and her husband founded, the senior editor at WhiteFire Publishing, and a member of ACFW, HisWriters, HEWN Marketing, and Colonial Christian Fiction Writers. Winter Reeves is an aristocrat…and a Patriot. Bennet Lane is a Yale professor on temporary assignment in New York…to find General Washington’s spy among the elite. Winter Reeves is an aristocratic Patriot forced to hide her heart amid the Loyalists of the City of New York. She has learned to keep her ears open so she can pass information on British movements to Robbie Townsend, her childhood friend, and his spy ring. If she's caught, if she's hung for espionage...well, she won't be. Robbie has taught her the tools of the trade: the wonders of invisible ink, drop locations and, most importantly, a good cover. Bennet Lane returns to New York from his Yale professorship with one goal: to find General Washington's spy hidden among the ranks of the elite. Searching for a wife was supposed to be nothing more than a convenient cover story for his mission, but when he meets Winter, with her too-intelligent eyes in her too-blank face, he finds a mystery that can't be ignored. Both believers...and both committed to a separate cause. Will their faith in God lead them to a shared destiny or lives lived apart? 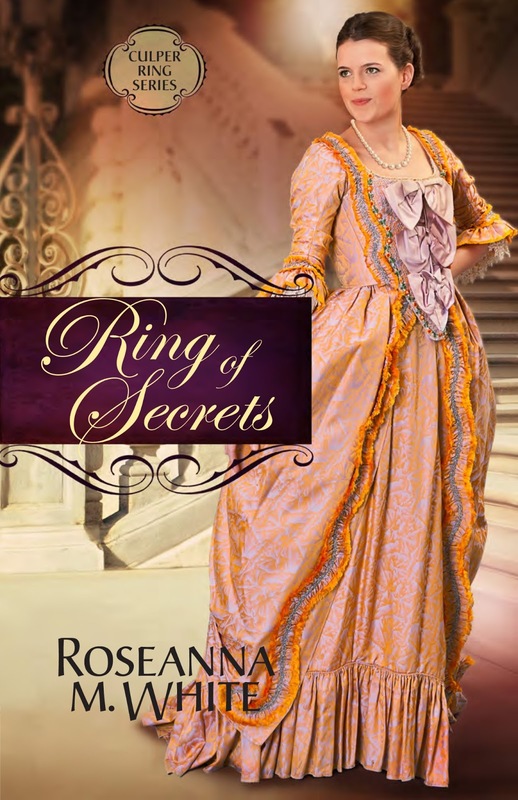 Ring of Secrets by Roseanna M. White is a well-written story about espionage during the Revolutionary War. I enjoy spy stories and this book was no exception! It is very different than the modern spy story. There are no technological gadgets or foreign passports (though they do have invisible ink and secret codes). It was interesting to take a peek back into a time when there was no CIA, no bugs, and no video surveillance yet spies accomplished a lot. The story is told from the point of view of Winter Reeves and Bennet Lane (each chapter it switches between them). The author does a good job of letting us into each of their heads. Poor Winter is living with two horrid grandparents who are trying to force her to marry someone soon. Bennet has his own struggles. Though there is tension and occasionally sadness, it’s not a depressing book and I love the ending! Let innocence be your mask. Winter Reeves swished her ivory lace fan and gave Colonel Fairchild the same practiced smile she always did. She squelched the response that wanted to escape, forbade her eyes from so much as flashing. Perhaps her gaze wandered, but he would only think her bored. He thought her very easily bored. Despite the racing of her heart at the pearl of information he had just let slip, she made her nod a half-second later than it ought to have been. As if she were inattentive, paying no heed to his endless prattle. Why, after all, would she care about such a boring matter as paper? In his eyes—in the eyes of everyone here—she was naught but the pretty, brainless granddaughter of the Hamptons. Let your beauty hide your heart. Winter’s gaze snagged on Robbie’s, though she looked past him quickly. A successful business owner and newspaperman for the Royal Gazette, Robert Townsend was deemed acceptable company on a day-to-day basis, but Grandmother had higher hopes for her. At social occasions, she was not permitted to speak to him. She didn’t have to speak to him. A mere glance showed her his waistcoat tonight bore seven silver buttons. Seven—that meant he had slid a note into the bottom, middle drawer of the chest in the drawing room. Feigning a yawn partially hidden behind her fan, Winter blinked. Slowly. Fairchild bowed, though he kept his head erect. No doubt to stop his new powdered wig, more heavily curled than his old one, from slipping. Winter dipped a short curtsy and headed for the ballroom’s exit, her palms damp. The matron lifted her chin. No one would doubt Phillippa Hampton was the queen of this particular event. Her hair was an extravagant tower of whitened curls, ribbons, and gems. Her gown was a creation so exquisite, King George himself would have envied the craftsmanship. Let your enemies count you a friend. “I should think so, knowing who awaits your return.” The snap of Grandmother’s fan of Spanish lace all but forced Winter’s eyes to the right. He was only passably handsome, if one examined his nose, his mouth, his jaw. Strong features, and sandy hair he hadn’t bothered to powder or cover in a wig. Pleasant, not exceptional. But those eyes—they seemed to pierce right through her facade, down to the heart she’d been forbidden to have. No. She couldn’t afford to let a man turn her head, and she certainly couldn’t let one see her heart. No matter that a single gaze from him made her yearn for someone who might understand her. Perhaps some other enterprising young lady would have laid claim to him by the time she returned. Eyes like that were far too dangerous. If one could call it fortune when one’s uncle’s son died and one’s father returned to England to learn to manage the family estates. Which Grandmother certainly did, being ever loyal to the Crown—no matter how hard the heel of His Majesty’s army crushed the city. To God’s ear. Somehow she suspected Mr. Lane’s gaze wouldn’t unnerve Dosia at all. Her friend had no secrets to be discovered. Winter made her escape from the ballroom. Guests filled the hallway too, and they would be in and out of all the main rooms in her grandparents’ first floor. She followed a bewigged couple into the drawing room and traced a path along the chamber’s edge until she came to the polished maple of the high chest of drawers. The bottom, center drawer was open a bit. Not so much as to be noticeable to anyone not looking, but enough that Winter could catch her sleeve on the knob as she walked by and make a show of looking irritated before freeing it. She folded the slip of paper she’d recovered into her fan, shut the drawer with a scowl, and then headed out of the room, inspecting her sleeve as if the lace had torn. No one stopped her as she darted up the stairs and headed for her bedchamber. That didn’t keep a relieved breath from seeping out as she threw the bolt on the door. Winter strode to the banked fire and stirred it enough to light a taper. She set the candle upon a table and pulled the slip of paper out. The message written upon it made her smile. How you make my day burn bright! Winter snorted a laugh and checked the right top corner of the page. An “H” marked it. The real message, then, would appear with the application of heat. Hands steady, Winter held the page close, then closer to the flame. Closer still until the smell of scorching paper filled her nostrils, until a faint sizzle reached her ears. Until the invisible ink filling the space between the lines of terrible poetry turned a golden brown. Eleven o’clock tonight. The tulip tree behind the stable. Eleven. She pulled the paper away from the flame and squinted to read the darkened face of the mantel clock. One hour more. Time enough to appease Grandmother, to bat her lashes and act the part of witless society lady for Mr. Lane. Then she could slip outside. She hoped Robbie would be there to meet her, and she could tell him what Fairchild had said. Though there remained the possibility that he had simply left another message for her. This one could bring her trouble enough. If her grandparents saw it, they would place her under lock and key to keep her from eloping as Mother had. Or worse, if Grandfather had meant the threat that still made her shiver. And she had no reason to doubt his sincerity, given the hatred he had never tried to hide from her. Time nipped at the back of her throat, each tick of the clock telling her to hurry downstairs. But first she tossed the page into the fire. As the flames licked over the wisp of paper and then smoldered into glowing ash, Winter held her spot, watching the last ember die out. In her mind’s eye, she saw another letter, another fire. Why had she burned it? Why? The last word she had from her father, the last thing her mother had given her before she passed away. A cloud must have raced over the moon, for deeper shadows cloaked her room. Winter spun for the door. Best to lock away the memories of Oyster Bay, of life before the war. Best to remember who she was now. Best to push down the longing to go back, even for one day, to the life she once knew. That life was gone. She had come to terms with that. Better a life among enemies than a noose around her neck. Bennet Lane buried his terror in a glass of cordial and silently recited some Latin to calm his nerves. How had he ended up once more in a ballroom lit with crystal chandeliers, surrounded by batting lashes and swishing fans? “Give me Euripides above this any day.” Ben forced a smile and stiff bow when a set of well-dressed young women glided by, simpering looks partially hidden by their fans. Ben grunted a laugh and sent his gaze over the gathering. Young ladies abounded, all in imported silk and lace. Some had beauty to their faces that couldn’t be hidden by the mountain of curls atop their heads; others relied on the fuss to bolster what nature had withheld. “I have spent too many years in Connecticut, with its boycotts and homespun. All this luxury is confounding.” He took another sip of his drink and let his gaze linger upon a young lady with pink powdered hair. She was pretty, but when they had been introduced, it had taken only a stuttered sentence from him for her eyes to glaze over. Perhaps she would be amenable to a suit, but he’d rather find a woman to court with whom he could have a full conversation every now and again. “Hmm.” He hated powdered wigs—itchy and hot. But he would do what he must. Ben scanned the room again, looking for the angel in pale blue and gold he had seen leaving a quarter-hour earlier. Hampton’s granddaughter, and hence the highest-bred young lady here. With her on his arm, he could secure invitations to all the elite’s functions. His family’s heritage gave him the proper pedigree for them, but he had been too long away from New York to know from where the invitations would come. Access was crucial. Somewhere in this ballroom, or another as exclusive, a spy might lurk. Someone undermining the British cause, feeding information to the rebel army that they could only have learned from high-ranking associations. Either an elite themselves, or one of the bottom-feeders who catered to them. He would find that someone, eventually. He must. And he was prepared to do whatever was necessary to achieve it. Even if that “whatever” meant attaching himself to one of these terrifying, lace-bedecked creatures. Ben folded his arms over his chest and nodded decisively. “Charlie in a dress.” An excellent plan. Bennet’s gaze followed George’s gesture toward the doorway, filled by the vision of beauty herself. Hampton’s granddaughter—Miss Reeves, apparently. Empty headed? That dug a furrow into his brow. When he had caught her gaze a bit ago, she had struck him as many things, but thoughtless was not one of them. Hers were not eyes that covered an idle mind. Were they? He was not the type to be so blinded by beauty as to attribute to a lovely face nonexistent qualities, was he? Well, time would tell. Hampton was even now striding toward Bennet, undoubtedly to make the promised introduction since his ward had returned. Which Georger apparently took as his cue to leave with a mumble about another drink. Miss Reeves held her place in the doorway for a moment more, looking out at the ballroom as if taking stock of everyone there. A princess surveying her kingdom? Perhaps. Certainly she put all the other young women to shame, from the details of her gown to the powdered tower of hair, to her face, exquisite in its detail. His pulse hammered. She was too beautiful for him. His tongue would twist into knots if he dared to open his mouth in her company. She would dismiss him in a moment, as every other girl did. He’d do better to find a more approachable lady to court, one common enough that she wouldn’t actually distract him from his true motive for returning to New York. Miss Reeves turned her head to her left and then moved toward Mrs. Hampton. Her every step was a dance, each gesture the epitome of grace. Ben would be lucky to secure a minuet with her, much less any other sign of favor. And because he was not so superficial as to think a pretty face was all one needed, he certainly wouldn’t mourn the loss of what would never be. She kept her gaze down as Mrs. Hampton ushered her forward. Seemingly demure, but there was something else in the tension of her neck. Something that spoke of anxiety, perhaps conflict. “Excellent, sir.” He should have stayed home tonight. Settled in with a text. Montesquieu, perhaps. Montesquieu would be a fine companion for this blustery November night, far better than this present company—George excluded. She didn’t look at him, though she turned her face his way. When he held out a hand, she settled her fingers on his so lightly as to barely touch him at all. Still, awareness coursed through him. She was even lovelier up close than from afar. A narrow bridge of a nose, lips of a perfect rose, brows that bespoke hair the color of his favorite mahogany chair—if one could see beneath the powder coating each lock, anyway. He bowed over her hand. “It is a pleasure to make your acquaintance, Miss Reeves.” Ah, not so much as a stutter. He would do his debate professor proud. She drew in a breath too short, too sharp. And finally she lifted her eyes to his. They were green. Deep as an emerald and not just in color. So many thoughts, so many needs seemed to swirl within those jewel-like irises for one fraction of a second—then it was as if a door slammed shut and they were only eyes. Pretty, empty eyes. He let her fingers go but couldn’t convince himself to look away from her perfect countenance. Not so much as a twitch revealed any thought at all, but he knew well he hadn’t imagined it. 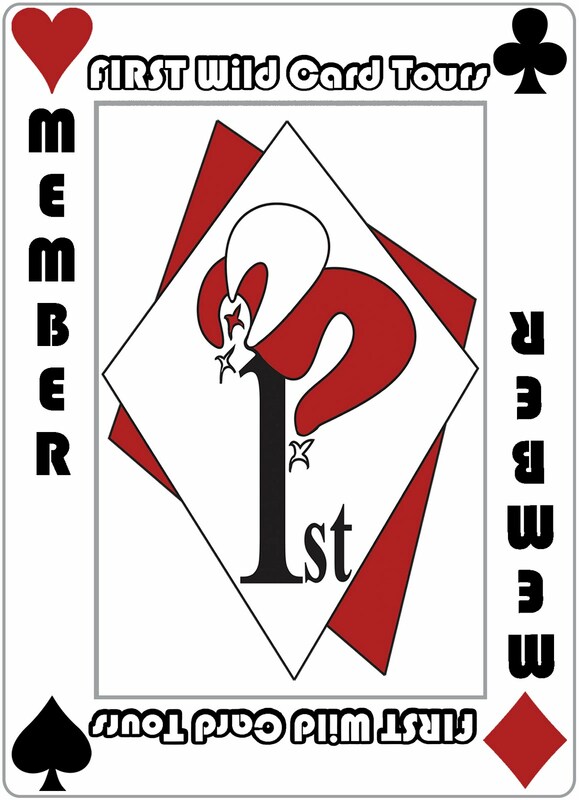 Winter Reeves was more than the face she showed this crowded ballroom. Why did she feel she must hide it? And what, exactly, was it that she hid? Puzzling. Hampton glowered. “She would be delighted.” Another word that seemed foreign to his frowning mouth. Mrs. Hampton, however, beamed. As for Miss Reeves...if he weren’t mistaken, that look of ennui upon her face was designed specifically to put him off. Well, they would see about that. Any philosopher, be he political or scientific or abstract, knew that sometimes one must revise one’s stated mission. His may have to become twofold. Find the Patriot spy in New York. And unravel the mystery that was Winter Reeves.